Auger conveyors are commonly used to handle grain, soybean meal, and mixed feed. Capacities vary with auger diameter and operating speed. Four-inch diameter augers, operating at a slow speed, can be matched to the capacity of PTO- or electric-powered mills. To save time and labor, at least 8-inch, preferably 10-inch or larger, diameter augers should be used for placing grain and soybean meal in storage and for load-out and delivery of finished feed. 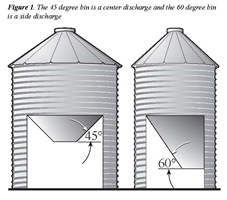 Grain augers are occasionally used to fill ground level bins, but should only be used with nonmedicated ingredients. It is difficult to avoid residue in augers or drag conveyors and extensive flushing is required to remove it. Once again, medicated ingredients are best handled in bags to avoid potential problems. For large feed systems, particularly those that include grain drying and storage, bucket elevators might be appropriate. They cost more than auger systems, but they have a lower power requirement and give longer, more reliable service. A bucket elevator can replace several augers in a system and reduce space required for handling equipment. Gravity spouts for dry grain must slope at least 37 degrees from horizontal (3/4 foot fall in 1 foot run); spouts for wet grain must include at least 45 degrees from horizontal. Gravity spouts for soybean meal must slope at least 60 degrees from horizontal (13/4 foot fall in 1 foot run). Overhead ingredient bins are filled using down spouts from an elevator leg. The downspout angle must be 60 degrees, or greater. Since the spout angle is high, most bulk storage bins must be located near the leg. The distance from the leg is proportional to the height of the leg. Often a second distributor is used to fill the bulk bins allowing better utilization of the main leg distributor. Medicated ingredients should be handled in bags in order to avoid residue problems. Feeds are often temporarily stored in overhead bins above a driveway prior to delivery to the feed tanks. Medicated feeds may have to pass through the leg and some residue may remain in the leg and in certain locations of the downspouts. This type of feed should be followed by a nursery ration to help flush out the equipment. It is important to mix enough medicated feed each time to avoid daily mixing and the potential for residue left in the handling system. The clean out or flush ration must be one in which the drug residue that may be picked up should not affect the pigs to whom it is fed. This ration must be fed to pigs such that labelled requirements for withdrawal times are met. Many delivery trucks can reach to the top of ground level hopper bins with their unloading augers. Most trucks cannot reach the fill port of a bin if it exceeds 25 foot. It may be necessary to specify in a purchase contract that feed must be delivered via truck with an unloading auger if this is the only way to handle the ingredients. Bulk bins need to be located near the mixer to minimize the investment in handling equipment. Normally, soybean meal will be added directly to the mixer, assuming it is on scales, or to a weighing/ batching hopper above the mixer. As the distance between bins and the mixer increases, additional handling equipment is required and increases energy and maintenance cost.